We are excited to announce that, as of this morning, we are operating a new coffee shop in the lobby of the AT&T Tower in downtown Minneapolis, located on the corner of 9th and Marquette. 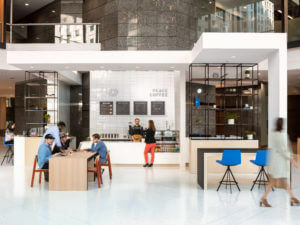 Our commitment to high-quality coffee, excellent service, along with our willingness to adapt to new and interesting spaces attracted the developers of the 901 Marquette/AT&T Tower lobby remodel. A meeting or two and many cups of coffee later and we excitedly jumped at the opportunity to be part of this ambitious project in an iconic part of the downtown Minneapolis landscape. We are open to the public 6 am to 4 pm Monday through Friday. We anticipate that the majority of our customers will be AT&T Tower employees, but we hope to also attract nearby office or other downtown workers who enter the skyway here. We look forward to providing delicious coffee to visiting guests staying at the nearby Hilton and W Hotels along with many other new neighbors as well! Our menu includes a rotating selection of our organic and fair trade coffee in drip and pour-over options, espresso drinks built with house-made syrups and Autumnwood Dairy, non-caffeinated options like local cider and Rishi Tea, and a cast of seasonally rotating specialty drinks. We are pairing our drinks with local pastries from the experts at Patisserie 46, gluten-free options from Sift Bakery, and a few light grab-and-go options. Guests are sure to enjoy the bright and airy atmosphere at this beautifully redone space inside the AT&T Tower lobby. With seating options aplenty, a fireplace, and windows that look out on a bustling corner of downtown Minneapolis, our space is open and inviting for a welcome respite from the cubicle. We look forward to further solidifying our place in the downtown Minneapolis caffeinated landscape. Published by Peace Coffee on September 10, 2018.